If you are not sure what to pack for Japan, we got you covered with our 10 Japan travel essentials in this article. Japan is one of our favourite destinations in Asia! First of all, there is no need to have any packing stress. Because everything you need can basically be bought in Japan. Actually, we recommend you to pack as little as possible and shop in Japan! But of course, we understand that it feels better to come a bit prepared. Below you can find our 10 Japan travel essentials. We found these items to be of importance or super useful during our trip in Japan, so we think they are worth sharing. Going on a long trip across the world? Be sure to also read our 15 Travel Essentials for Longterm Travellers! 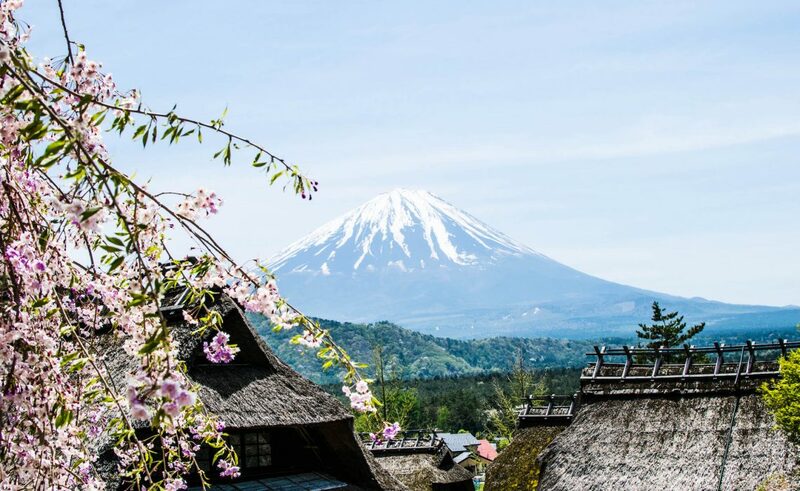 And for more Japan inspiration, read our articles with tips for your travels to Mount Fuji, Tokyo and Osaka. We usually use guidebooks to get inspired and even more excited about upcoming trips. Of course guidebooks can also be useful to plan your journey in Japan or look for day trips while you’re there. There are plenty of guidebooks to choose from! We always love the classical Lonely Planet guides. Be sure to also use our website as inspiration and check out our Japan archives. We’ve written about Osaka, Tokyo and Mount Fuji. We’re also planning to write an article about Kyoto, so keep your eyes peeled! In Japan you walk a lot, because there is so much to see! During our exploration of Osaka, Tokyo, Kyoto and Mount Fuji we mostly used the public transport and our two feet. The last thing we wanted was to have sore feet because of the shoes we choose. We can’t stress this enough: bring shoes that are comfortable! No fashionable heels or sandals. Sneakers are fine, we used them too, but be sure that they’re actually good for walking a lot. Don’t use shoes that give you blisters, because you will hate yourself. Also, in Japan you often have to take off your shoes. Like in most Asian countries, you have to remove your shoes when you’re entering a shrine or temple. But, in Japan you also have to remove your shoes in most restaurants and cafés, even in a lot of hotels and ryokans (traditional hotel rooms). And of course anywhere where there is a tatami mat floor. We suggest to pack light, especially if you’re planning on seeing more than one place in Japan. Most travellers choose to travel by train in Japan and most Japanese trains and stations are not very “luggage-friendly”. Trains often have limited storage compartments, and if they do, they aren’t built for big suitcases. Both trains and stations can be super crowded and stations don’t even necessarily have a lot of elevators or escalators. Imagine carrying your super heavy suitcase up on stairs while it’s super busy. So it’s really better if you take a small carry-on with you. That way you can easily navigate around Japan. We brought our backpacks to Japan, as we were already backpacking in Asia for six months when we entered Japan. But, as we mostly travelled in Japanese cities, we definitely preferred a small suitcase. If you’re travelling in the cities of Japan, a carry-on will be perfect to carry around your stuff. Of course, if you’re planning on doing any hiking or treks a backpack might be better. However, it would also be possible to leave your suitcase at an accomodation and bring a daypack with you for the hike/trek! Everything in Japan is super clean, but often they don’t provide paper towels or hand dryers in toilets. It’s quite common in Japan that people carry their own small towels/handkerchief! Japanese women carry a tenugui hand towels with them, which is a traditional Japanese towel: a flat-woven cotton cloth. Besides the functionality of drying your hands, the tenugui are also used for covering heads or as aprons. They actually make an excellent souvenir or gift! They come in a variety of patterns and colourful designs. The voltage in Japan is 100 volts, which might be different than where you’re coming from. So, you might need a converter. Furthermore, the power outlets in Japan might also be different than where you are from: Japan uses a two-prong plus. So if you have a third pin, or if you have an European/UK-style plug, you need a travel adapter. Therefore, in order to charge your electronics, bring a world travel adapter so you can use the Japanese style plug sockets. Most electronic stores in Japan sell them too, so no problem if you forget to buy one. WiFi in Japan isn’t as widespread as you would think it would be. Most hotels do offer WiFi in the common areas and free WiFi hotspots have become more and more readily available at international airports, major railway stations and certain restaurants and cafés. So, it’s definitely improving. However, we noticed while we were travelling around, it wasn’t always easy to find a hotspot, nor was it easy to ask for directions. Therefore, we eventually starting using our Skyroam WiFi device when we needed Google Maps or needed to look for a place to eat. 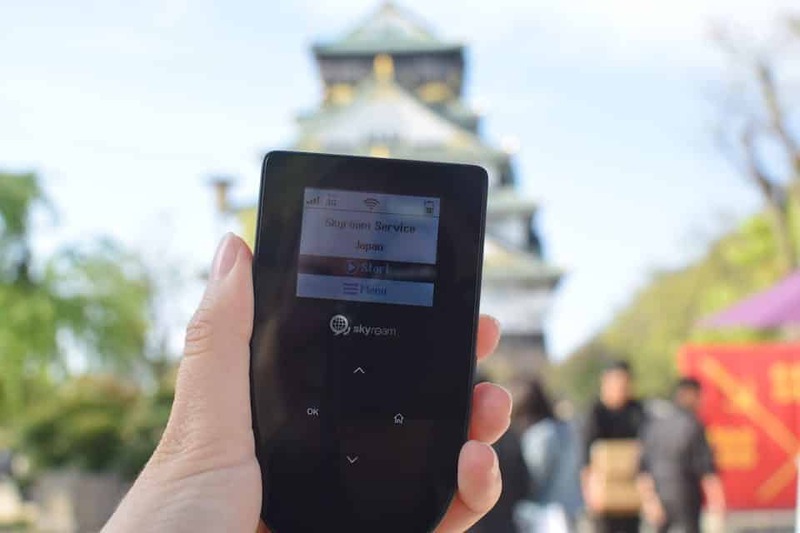 While we were in Japan we had our Skyroam WiFi device with us, so we could use Google Maps whenever necessary. It’s also possible to get a travel SIM card that works with unlocked phones. There are plans available for tourists that are data-only. Often they are for a specific time period, such as 7 days. These SIM cards are available at airports, selected shops or you can order them online and sent them to your hotel. Two of our airbnb hosts even offered us a complimentary Pocket WiFi, so you might not even need to rent your own if you’re also planning on staying at an airbnb! Never used Airbnb before? Use our discount code! A portable battery pack is always a good idea to bring with you on a trip. You don’t want your phone dying on you while you need it most. We often had stressful moments when we needed to look for directions and our phone’s battery was already in the dreaded red area. We therefore recommend to buy a good battery pack to bring with you in Japan! Of course you want to capture your time in Japan! You can’t go to Japan and not take any photos. In order to quickly grab your phone and snap a ton of photos, we recommend to bring an add-on lens to make your photos even better! It’s easy to carry around, especially in comparison with a heavy DSRL camera. If you rather not use an add-on lens, but really want to take a camera with you, we recommend you to take one that is not too heavy, but still takes great quality pictures. We own a Nikon D3300, which is an DSLR camera that is easy to use. It even has a guide option to help you use it. Plus, it’s super compact and easy to carry around! Leave space in your carry-on: Shop in Japan! Anything can be bought in Japan and it’s actually an excellent country to buy some of the most fashionable items. Therefore, we can’t say this enough: leave enough space in your carry-on and shop in Japan! Buy souvenir and gifts for yourself and your friends. Do you have any little ones back at home? Check out the adorable Line Friends, which products can be a bit pricey, but so adorable! It really depends on the season what you should wear in Japan. In total there are four seasons, but of course it can vary per year. It can be very hot or very cold, or somewhere in between. Always be sure to check the forecast before your trip and dress accordingly. As you most likely will walk a lot, we recommend you to wear layers with breathable fabrics. That way you can always dress down if it gets too hot. We mostly wore comfortable clothes, and I only dressed in traditional clothing during our trip to Mount Fuji. Like said earlier in this article: don’t bring to much. Leave space in your luggage so you can shop in Japan, as here you can find unique clothing of great quality. We especially liked to shop in Tokyo, there are a lot of cool shops to get great items. The style in Japan really varies from area, and ranges from casual to super fashionable. We definitely recommend you to dress up in traditional clothing at least once. 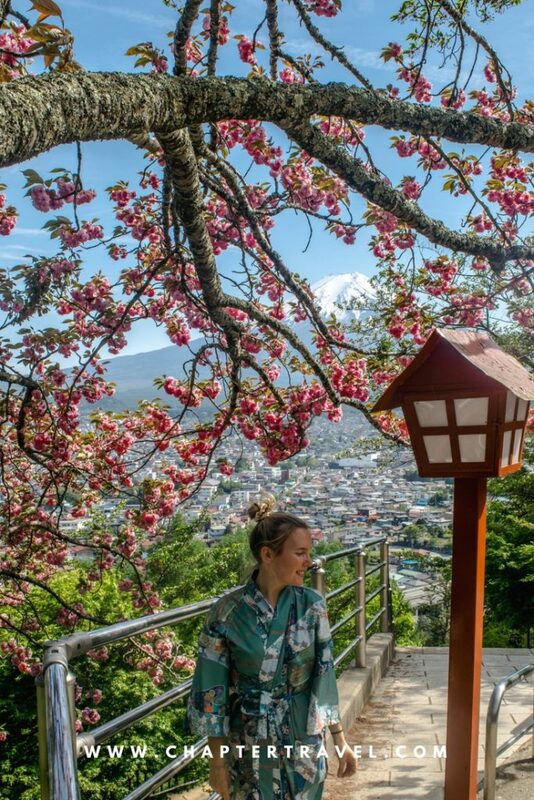 Why don’t you dress in a traditional kimono in Kyoto? We missed out on this experience and certainly regret it. So, are you ready to pack for your trip to Japan? 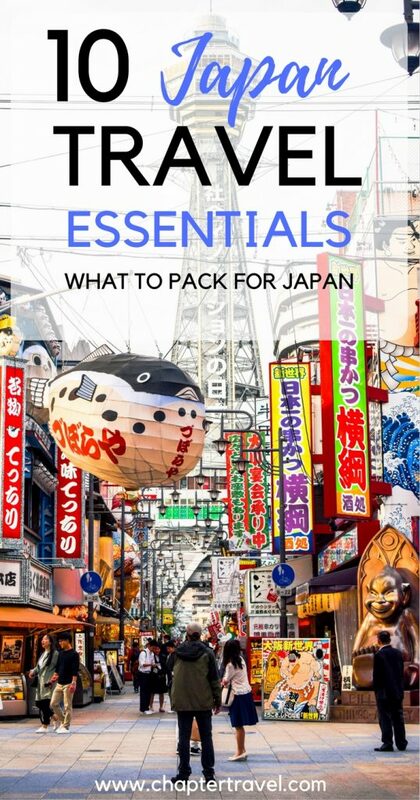 We hope you now know what to pack for Japan and find this list of 10 travel essentials for a trip to Japan useful. Again, don’t worry, because you can buy anything you need in Japan. We bought most of our Japan travel essentials while we were already there, except for our WiFi device, world travel adapter, comfortable shoes and daypack. Let us know if you have any questions about your trip to Japan! Check out our contact page to sent us an e-mail.